Dropped waist at seam: 35"
Centre front neck to dropped waist: 21¼"
Black velvet jacket style bodice and sleeves, with bold white Celtic knotwork. 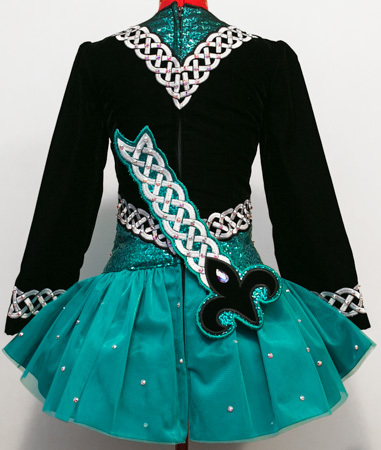 Jade green sequin lower bodice and matching jade green tulle skirt. The bodice is fully lined and the underskirt is lined in a bright pink and white striped cotton. Swarovski AB crystals in various shapes and sizes for added sparkle. Good condition. Worn approximately 10 times only.